Cara Silletto is a retention guru who works with companies all around the country, in all different industries, to help them reduce employee turnover. To accomplish that, she bridges the generational gaps and helps managers be more effective in their roles. This is an issue that comes up a lot in firms today and it’s only going to be a bigger issue with each passing year. So if you’re clinging to the old ways – well, consider this a wake-up call. Cara is the author of a short book titled The Millennial Mindset (which you can get for free here). It contains some stories about Cara’s childhood, as she happens to be one of the oldest millennials, talking about things like technology, respect for authority, and entitlement (everybody’s favorite topic when it comes to millennials). Cara also co-authored a new book called Staying Power: Why Your Employees Leave and How to Keep Them Longer. This book focuses on specific strategies for reducing employee turnover today, covering the evolution of our employees over the last 20 to 30 years in the workplace. The power has shifted – and it’s time for your mindset to shift as well. Survey after survey says that the new generation of workers don’t leave because of pay. They leave because of things like antiquated software and mandatory Saturdays. What the new generations want is flexibility and to be heard; they would like more transparency across the entire organization. It can be frustrating for staff when they feel like the partners are the only ones who know what’s going on. People are only going to stay as long as they feel that it’s a good place for them to work and you’re only going to keep them so long as they’re providing what you need as an employer – so it has to be mutually beneficial. Some of you are probably cringing right now at the idea – “That’s why they get a paycheck,” after all. But we know that there are people who come to work and don’t do their job, or they don’t do a great job, or they’re not as dependable as some of the other staff on our team. You will gain so much more loyalty and people will want to work for you longer if you show the appreciation that is deep down inside of you. Because if you dig down, you probably are thankful for the people who show up, show up on time, do great work, and take great care of your clients or any of the projects that they’re on. GIVEAWAY: Want a free copy of Staying Power? 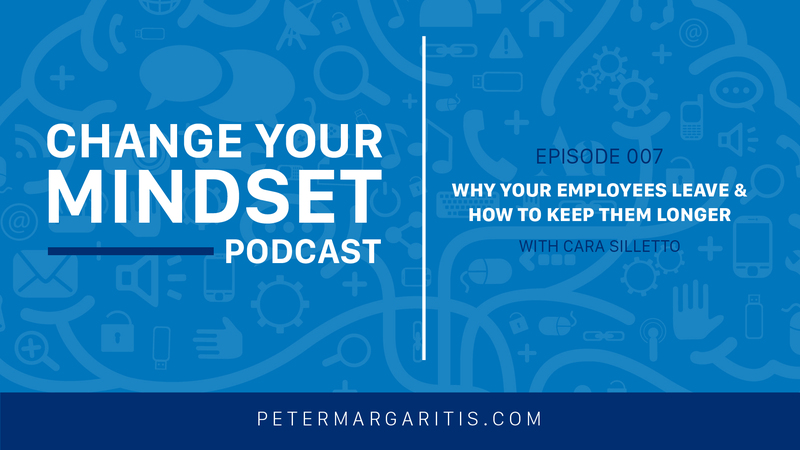 Cara is offering one free autographed copy of Staying Power: Why Your Employees Leave and How to Keep Them Longer to Change Your Mindset listeners. If you want a chance to win, all you have to do is tag Peter on social media and mention the book. After a week, we will pick one lucky winner to receive a signed copy of the book. Peter: [00:00:00] Cara, thank you so very much for spending some time with me today on my podcast. I’m so looking forward to our conversation. Cara: [00:00:06] Thanks, Peter. Me too. Peter: [00:00:07] It’s good to have a fellow Kentuckian finally on my podcast. Peter: [00:00:13] Even though you’re a UL fan, I’m a UK fan, I’m sure we’re gonna get along fancy today. Cara: [00:00:18] Yes, I won’t hold that against you, Peter. Peter: [00:00:23] Go blue. Cara, can you give my audience a little bit about who you are and what you do? Cara: [00:00:32] Sure. So, my name is Cara Silletto, and I am a retention guru. I work with companies all around the country, all different industries to help them reduce employee turnover today. And we primarily do that by bridging the generational gaps and making managers more effective in their roles because, as we know, most people leave their companies, you know, not because of pay, but because of their managers, and that they don’t feel appreciated, or don’t have a great relationship with their supervisor. So, that’s what we focus on. And you can imagine, with that being a hot topic, we are pretty busy right now. Peter: [00:01:11] I imagine you are because, I think, during setting up this podcast and communicating with who you, you’re like overseas for a week or so? Cara: [00:01:19] Yeah. So, I did an international engagement down in Curacao, which is an island near Aruba, and it’s just north of Venezuela. That was pretty exciting. The gentleman who booked me down there, he actually saw us speak, me and my training partner in St. Louis, but he was from Curacao. And so, he asked to bring us down there, and I worked with six different companies and government agencies to help them bridge the generational gap. So, it’s not just a US thing, that’s for sure. It’s happening all around the world. Peter: [00:01:50] Yes, it’s very much international. Was that like in February when it was like cold up here, and just absolutely stunningly beautiful down in the Caribbean? Cara: [00:01:59] Yes, it was snowing when we left Louisville. And that was fantastic because we had to quickly shove our jackets in our bags when we got down there. And it was a beautiful week. Peter: [00:02:10] I can imagine. And you’re an author as well. You’ve written two books. Can you tell us what those books are? Cara: [00:02:17] Sure. So, we have a small mini book called The Millennial Mindset. And that is some stories about my childhood. I happened to be one of the oldest millennials. And so, we talk about things like technology, and respect for authority, entitlement, which is everybody’s favorite thing to say about millennials. And what that little booklet talks about is the backstory of why am I, as a millennial, why am I so entitled, and why do I have no loyalty to anyone or anything. Cara: [00:02:49] And I tell some childhood stories about, you know, real things that happened to me. My parents got divorced when I was young. My mom, who happened to be a corporate accountant, she got laid off three times before I hit college. And so, when you’re a child going through those things, you don’t even know what loyalty looks like. And coming in as a worker, then, into a work world where my employer expected me to trust them and to stay long term, after I saw my mom work late at night, and then get laid off. I mean, there’s no guarantees. So, that little booklet tells a lot of those stories of how I grew up differently than the previous generations, which is a pretty good aha moment for a lot of managers and older colleagues even that really do not understand how millennials see the world so differently. Cara: [00:03:44] And then, I’m so excited to announce that we just launched a new book this spring called Staying Power: Why Your Employees Leave and How to Keep Them Longer. And that book also has quite a bit of information about the millennial mindset and the evolution of our employees over the last 20 to 30 years in the workplace. And it, of course, focuses on specific strategies of how to reduce employee turnover today. Peter: [00:04:15] Outstanding. And we’re going to talk a lot about the book, but I want to back up to you a little book for a second because, on your website, you’ve got about an 18-minute video of you giving this talk. And for those of you who are listening, we’ll put a link in the show notes. Go watch this. One, she’s funny. She’s got some great stories. But she really frames that mindset. Oh, by the way, like she said, she is a millennial, which is a great thing. I’ve almost quit using the term millennial. It’s just the younger generation. Peter: [00:04:50] Because there’s that stigma that has been attached to it. And I think that stigma is incorrect. Cara: [00:05:09] You know, that type of thing. And, of course, some people have a very positive thought of millennials, and that’s fantastic. But we refer to them more as today’s new workforce because what we find also is, first of all, there’s no one definition of millennials. People decide based on the research they do. So, different researchers, Pew, and Deloitte, and the Bureau of Labor Statistics, they all just picked their own start and end time. Cara: [00:05:39] So, first, it’s a little bit difficult to put a definitive definition on the dates and the birth years of millennials. And what we argue as well is it’s not about your birth year, it’s about your mindset. It’s about the way that you were raised because, sometimes, I meet people who are younger than I am, and they were raised in a much more traditional family, very hierarchical. Maybe they have a military background, or they grew up in a small conservative town. They don’t think like I do. They’re going to be more traditional, for sure. Peter: [00:06:14] Do you refer to them in the video as the old soul millennials or something like that? Cara: [00:06:20] Yes. Yeah, we call them the old souls. Cara: [00:06:23] And, you know, it’s funny because employers come to me all the time, and they say, “How do we recruit more old souls because we want people that just do the job, and do what we say, and they don’t wear leggings to work,” and, you know, things like that because the old souls tend to act and think much more like a baby boomer or even a Gen-Xer. Cara: [00:07:24] … we tend to think, especially the younger people in the work tend to think that boomers are set in their ways, and they’re old school, and, you know, that type of thing. So, there’s negative and positive stereotypes and things on both sides, for sure. Peter: [00:07:38] You know, I worked at a university for a number of years, and I saw how a lot of this changed because we were getting calls from students’ parents asking why Little Johnny failed the test. And we go, “Well, ask Little Johnny why failed the test. Don’t call us.” I was also hearing stories from some of my partner friends in accounting firms that if a candidate didn’t get an offer, the parents were calling up to try and to find out why. Cara: [00:08:06] It happens so often now. And, you know, here’s what’s funny. We can easily judge those millennials and say, “You need to grow up, and, you know, you need to be more adult,” or “Stop being so entitled,” or whatever it is that we want to say about them.” But the reality is the millennials don’t know any different. Cara: [00:08:30] They only know a world where we get what we want when we want it. You know, we have drive-throughs, we have credit cards, we have Netflix, and Amazon Prime two-day shipping, and things like that. And so, when we look at something like that about the parents, don’t blame the millennial. Blame parents. Peter: [00:08:58] And then, they start laughing, “Well, no, no, no. It’s not my kid. Not my kid.” I go, “Yeah, right. Yeah.”. Peter: [00:09:04] And I’m guilty. My son’s 17 years old, and he’s at the tail end of the millennial, and the things that I saw, my wife, he was on a dive team. And when he got a 12th place ribbon, I almost lost my freaking mind. My wife said, “Get out of here.” I have both of those ribbons just to keep around. But, like you said, he’s used to … Now, he’s 17 years old, going to be 18 in a month. By the time this year he should be 18, hopefully, he’ll have his license by then. Cara: [00:09:41] Are you serious? Cara: [00:09:43] He still doesn’t have his license? Cara: [00:10:01] Yeah, that’s true. Cara: [00:10:34] … because they’re not part of an entry level position. So, yeah, that’s a whole different ballgame. Peter: [00:10:39] Yeah, it really is. But, you know, I’ve worked with them for so long. Like I said, I’m a baby boomer with Gen X and Gen Y tendencies. I look at them … Hold on, my dog. Then, hopefully. you can take this, my dog barking out of this podcast. I can hear her. Sometimes, somebody is at the door, she’ll just start barking, and barking, and barking. She, eventually, will stop. Peter: [00:11:19] He’s got that kind of thought process. He can figure things out. And he’s used … I mean, obviously, they’re used to using their thumbs, they’re used to technology. And if they come in to the workforce, if they’re hired by an accounting firm or a corporation, and they don’t have screens to look at, and they’re not up with technology, they’re not going to stay. Peter: [00:11:42] They’re going to go find that. Cara: [00:11:43] Oh absolutely. Survey after survey that we have done or looked at, it says that they don’t leave because of pay, they leave because of things like old antiquated software that is terribly slow to use, and it slows them down as an employee, and they won’t put up with that. If you’ve got software that just churns and churn, or is just difficult and clunky to use, that can absolutely cause turnover. As much as you think, “Oh, it doesn’t matter. They just need to be patient and deal with it,” that’s just not the case. They will leave because of that. They will leave because of scheduling issues. Cara: [00:12:21] One of the biggest things that I’ve seen, particularly with CPA firms, is the mandatory Saturdays. Yeah, people will not do mandatory Saturdays anymore. And so, I’m seeing firm, after firm, after firm who had mandatory Saturdays during tax season. They’ve had that for decades. That was an expectation. Cara: [00:12:41] And now, what the transition is it’s not that they’re expecting any less out of their people, but they’re giving them flexibility to bill those hours any time during the week. If they want to pull later days, or come in on Sunday or Saturday night, work from home, wherever they can hit those billable hours, they can still do it, but they’re not requiring people to come in from 9:00 to noon every Saturday morning anymore because you don’t have to do that. We have access from afar now. Peter: [00:13:12] Right. In an earlier episode, I interviewed two partners, a firm in Maryland, DeLeon & Stang. And I got to know this firm, and they’re really unique. And they just instituted an unlimited PTO. Cara: [00:13:29] There we go. Peter: [00:13:30] As well as Saturdays are not mandatory. And it’s just kind of empowers. They’re still going to take care of the clients, but we’ve … They even changed their mission statement to put it used to be we put our clients, and then staff. Now, it’s we put our people first, and I know they’ll take care of the clients, kind of like the Richard Branson of Virgin Airlines quote. Cara: [00:14:22] Yeah, that’s a huge change today. And, honestly, any of the firms who are set in their ways, and they have old policies, you know, just long-term policies that they haven’t revisited, those are the ones who contact me and say, “We can’t recruit anybody. And when we do recruit somebody, they’re only staying one or two years, or they don’t want to be on the partner track anymore. What’s the problem?” And the old model just doesn’t work any longer. A lot of the young people, they want opportunities for advancement that are not just the partner track. You know, the partner track is like an all or none. Cara: [00:15:00] Plus a lot of millennials, I mentioned earlier, we have no loyalty as far as loyalty for loyalty’s sake. Cara: [00:15:18] And even if I like working there, I may not want to be partner track because that ties me to that organization and those other partners potentially for life for my whole career. And a lot of millennials just want options. They want flexibility and choices. Peter: [00:15:36] Exactly. And as you’re describing that, you know, two things came into my head. I really was a millennial early on in my career because my average length of tenure at an employer was about four years. Then, I move to something else, move to something else. So, I was considered a job-hopper back in the day. But, now, I was considered somebody who had a broad brush and wide variety of cultures and things to bring to an organization. Peter: [00:16:13] “Why should I show them to the training? Why should I invest into them? Well, if you don’t invest in them, if we all have that same mentality, when they leave, when you recruit, you’re not getting anything better. Cara: [00:16:50] So, that’s much worse. And I’ll be honest with you too, training now is not an option. It is not a perk anymore. It is absolutely required, and expected, and demanded from today’s new workforce. So, they want you to invest in their career. They want you to invest in their professional development, both technical skills and soft skills like leadership, communication, organizational skills, things like that. So, it’s really not an option. Cara: [00:17:23] And what I saw happen was 10 or 15 years ago, at least, companies cut training and development. And that is so sad because it has now come back to haunt us where we promoted all these people into supervisor positions, and just up the chain, and even made them partner; and yet, they don’t have people skills to work with their team. They don’t have people skills to work with their colleagues, and then they upset everybody, or maybe even have a toxic attitude or toxic behavior within the workplace that is just ruining the whole place for everybody. Cara: [00:18:01] So, very important that we reinstate more training. And there’s so much out there now. There’s online training. There’s conferences, and external seminars, and programs you can send people to. And then, a lot of clients, obviously, they bring in folks like us, right, Peter? Cara: [00:18:18] And we’re called in-house and do that training. So, I’m seeing a huge uptick in the amount of training that firms and corporations are doing because they realize they’re kind of behind the eight ball in many cases. Cara: [00:19:14] Yes, and some people that comes naturally for. Cara: [00:19:20] Other people, they are coachable, and they can develop those skills. And some people are not coachable. So, they might be … I mean, we all know one of those people or a few of those people, and they may be the best at their craft. They may be the best technical person. But what I talk to companies about a lot is creating different career paths for those people because if you just say, “Well, you’re my best accountant, so I’m going to make you this accounting team manager,” or something like that, or a department manager, even in engineering or nursing. Cara: [00:20:21] “I just want to be head down, and do my job, and do what I love. And I got to manage all these people, and mentor them, and deal with them.” And then the people under them are saying, “Oh, man. I feel like I’m bothering my boss, and he can’t really help me. He can’t mentor me, or he doesn’t have time.” I mean, that just doesn’t help anybody. So, instead, I love when organizations create multiple paths for advancement. And so, you hear a title like senior advisor or something like that, which tells me that person is so good at what they do, but they probably shouldn’t be managing people, and that’s fine because they can still be promoted, and they can be a mentor or an advisor for somebody else, or for a team, but they don’t have the direct responsibility of leading and managing others. Peter: [00:21:13] Exactly. And when I think of what you’re describing because I know of one firm, in particular, that had … I guess, somebody I worked for, highly technical, but they didn’t want to put them in front of clients. Peter: [00:21:29] Smart as a whip, technically sound, and, as you say, this person, it was not he wasn’t coachable. It just wasn’t in his DNA, but they saw the value in the person. and they kept moving him up the ranks until … They weren’t going to make him a partner because, really, a partner is a salesperson. They’re trying to get business. Peter: [00:21:48] But they made him … They may have called it a director of something else, and he resides in that role, and is happy, and a value to the firm. But they knew his strengths and his weaknesses, and they kept him versus, “Well, you’re not partner material. We’re going to let you go.” That’s a highly productive individual that’s hard to replace from a technical standpoint. Cara: [00:22:12] Right. So, that’s that’s the argument. If you have a rigid hierarchy and a rigid structure that you are not willing to be flexible and creative to create the kind of position for that type of person, super valuable to the organization, but just because he doesn’t fit into your mold and into your structure, you would let somebody like that go. No way. We just put a buffer in between that person and the clients. You know, we make some kind of account executive, or client relations person, or, you know, somebody else who is a similar role but just better on the front side of things the front of the house. And, yeah, you use that person to their ability, put them in the right seat. Absolutely. Peter: [00:22:55] So, a highly productive individual comes in, doesn’t get these skills, they put them in this role, they get frustrated, and they leave, what does that cost the company? What is the cost to replace that individual? Cara: [00:23:09] So much. I mean, even entry level folks, you’re looking at $15,000 to $20,000 of replacement costs. The higher their skill set, the more specialized they are, we can calculate 50 grand, even up to 100 grand sometimes that it would cost to replace, and retrain, and get somebody else up to speed on the company systems, and processes, and people, you know, the relationships that crumble when that person walks out the door, all of those things. I mean, it’s unbelievable costs that are happening. Cara: [00:23:42] So, really, the firms, I mean, nobody can afford to let that happen. They can’t afford to lose somebody great like that right now. And the other piece of that is they can’t afford if they put that person in the wrong spot, if they promote that person to be people’s managers, I guarantee they have more turnover than necessary under that person. That other people who are coming in, entry level folks, or anybody who joins that team, they get frustrated, and then they’re likely to go jump ship when all these other people are calling. I mean, you know, today, we are in an employee’s market. Cara: [00:24:24] It’s absolutely the employees’ choice, the candidates’ choice of where they’re going to work. And so, any employer or any leader that says, “Well, they’re lucky to have this job,” it’s just not true anymore. It is not true. We, as the employers, are lucky to have the talent we have, and we have to try harder to meet their needs, not just bend over backwards for them, and “Oh, we got to put in beanbag chairs and ping pong tables.” No, that’s not it. Cara: [00:24:57] What they want is they want flexibility, they want to be heard. They would like more transparency across the organization. I know a lot of staff get really frustrated when they feel like the partners are the only ones who know what’s going on. Cara: [00:25:12] That, “Nobody tells us anything. We’re not privy to any information about the company or decisions being made.” And I’ll tell you, your staff, all the way down to the new hire, they want to know what’s going on. They want to be involved in those discussions and those decisions. Peter: [00:25:45] … in those environments as well. So, I just wanna make sure that we, you know, kind of address that. You know, firms, they operate completely different from a hiring perspective versus, you know, a business in industry, but, no, both have the same types of issues and trying to address them is necessary. Cara: [00:26:04] Yeah, absolutely. Everything we’ve talked about is applicable and transferable over into those corporate finance departments. Yes. Peter: [00:26:12] So, what are you seeing out there on the horizon in your crystal ball? Cara: [00:26:16] That’s a great question. You know, what I do see changing is long-term employment is a thing of the past. And so, while previous generations, they had pensions, and they had those employer-employee relationships that were very long-term-focused, I just don’t see those happening near as much as they have over the past 30 to 50 years. Cara: [00:26:48] And so, what I encourage employers to do is to realize that the deep-rooted trees that we call them, which is somebody who’s been in your organization a long time, they have deep roots, and they’re probably not going anywhere until they retire, but as those trees retire out of the organization, be prepared for that role or that position to transition over, and become more of a revolving door position. Not that revolving door. It doesn’t have to mean, you know, six-month or one-year people. It’s not that kind of revolving door. Cara: [00:27:48] … because we can survive. We, absolutely, can survive with a different staffing model and meeting our clients’ needs, but we have to face the reality that it’s going to be very difficult to keep people even to the 10-year mark anymore because it’s an employee’s market. We have people poaching your folks on LinkedIn, and, you know. So, it’s not even about somebody saying, “Oh, I’m so unhappy. I’m going to go find a new job.” No, it’s the recruiters who are calling and the other companies that will call and try to lure those people away as well. Cara: [00:28:24] So, you really have to listen to what your staff wants and needs. We have to try to meet those needs as best we can and kind of compromise, meet in the middle on a lot of things, update our policies, and understand that this relationship has to be mutually beneficial. They’re only going to stay as long as they feel that it’s a good place for them to work. And you’re only going to keep them so long as they’re providing what you need as an employer. So, it has to be mutually beneficial. And that’s probably going to be somewhere between the three and ten-year range for most of your folks moving forward. Cara: [00:30:13] … we were talking earlier about participation ribbons and trophies, and, you know, that’s one of the stereotypes about millennials. They go home with 9th place and 12th place trophies and things, which by the way not our fault, that was our parents’ and coaches’ fault for doing that. But what we see today is that our new workforce, and this includes people of all different ages, they get very frustrated when they do their job, and they do a really good job, and they are dependable workers, and they do it day in and day out, and they still feel like they don’t get the appreciation they deserve for doing a great job. Cara: [00:30:53] And so, a lot of leaders are still thinking, you know, like we did 10, 20, 30 years ago, and they say, “Well, I’ll say thank you when when somebody goes above and beyond. You know, if they stay late, or they resolve a problem, you know, that maybe wasn’t even on their plate, but they helped and stepped up. So, then, I’ll say thank you.” But today, I want to challenge your listeners, I want to challenge each and every one of you to turn up your appreciation dial and start to thank people for doing a great job, even if it is their job. Cara: [00:31:30] Now, I know some of you are just cringing right now because you’re like, “That’s why they get a pay check,” you know, “I shouldn’t have to thank them for showing up and for doing their job.” But we know today that we have people who come to work, and they don’t do their job, or they don’t do a great job, or they’re not as dependable as some of the other staff on our team. And so, you will gain so much more loyalty, more tenure, you know, people will want to work for you longer if you show the appreciation that is deep down inside of you. Because I know that if you dig down, you really are thankful for the people who show up, who show up on time, who do their job, who do great work, and who take great care of your clients or any of the projects that they’re over. So, that’s kind of a mind shift and a mindset change that I would challenge each of your followers to really think about. Peter: [00:32:31] Yeah, exactly. It’s that, sometimes, I’m speaking to an audience of CPAs and accountants, I ask them what business they’re in. And then hear, “We’re in the consulting business,” or “We’re in the compliance business.” I go, “It’s a byproduct. It’s a byproduct. What is your main business that you’re in?” And I’ll get them frustrated. Then, I look at them, and I say, “You know what business you’re in, you’re in the people business, first and foremost. Without people, you have no staff. Without people, you have no clients and customers.” So, once we realize that we’re really into human being and people business, that’s the most important asset that we need. Cara: [00:33:27] That’s exactly it. Cara: [00:33:29] Yeah. The employees should be considered your internal customers. Cara: [00:33:34] We talked a lot about that. And so, if you think about all the market research we do for our external customers that we figure out, what do they want, how are their needs changing, we will follow the trends, and get data, and talk to clients about what do you what differently, what new services do you want us to provide, and we evolve for those external customers. And yet, in many cases, we’re still managing people, and hiring them, and have staff structures that we’ve had for 10, 20, 30 years. So, we have to go to where the customers are, whether you’re evolving your services, and the way you do things to meet the needs of your external customers, but also evolving for your internal customers. Cara: [00:34:19] One other quick story that comes to mind for me is I was actually working with a law firm that one of the partners said, “I come in every day at 7:00, and I’ve got this new attorney on staff who he’s supposed to be here at 8:00, but he rolls in at 8:15, 8:30, and one morning at 7:00. I had a question for him, and I had to wait an hour and a half to get my question answered.” And I thought, “Why did you have to wait an hour and a half?” He said, “Because he came in late that day.” And I said, “Why didn’t you text him, or e-mail him, or call him, or anything else besides wait for him to be in the office? If you had tried any other communication channel, you could have had an answer at 7:05 or 7:10.” I mean, I would have responded via text call or e-mail from bed if he was still sleeping, you know, and waking up. Peter: [00:35:18] Right, right, right. Cara: [00:35:19] Or while he’s getting ready, or while he’s even driving to work, he could have taken the call, or in the Starbucks line, or you know, that kind of thing. And so, one of the things, I think, we really need to understand too is that visibility in your desk chair is no longer the equivalent of productivity today. And so, that’s one of those generational gaps that I see over and over again is that the older colleagues, or managers, or partners, they think that if somebody is late, they’re not a hard worker, or, you know, the first one in the last one to leave, that’s my hardest worker. That was the case 20 years ago when we didn’t have smartphones, when we didn’t have a VPN connection that you can get to from home. You know, it’s a totally different world today. Cara: [00:36:09] So, we need to start reducing judgment. That’s really what we’ve got to do to bridge the gaps is start asking more questions, listening, keep your eyes and ears open, and just quit judging people because they don’t work or dress the way that you do. Peter: [00:36:54] “And, by the way, when you go to the bathroom, you take a file with you because it looks like you’re busy, and you’re going someplace, and you’re working, so they can see you doing that.” And that was … I can still hear him say that. And, you know, the cheeks in the seat process of mentality has gone away. Peter: [00:37:12] Or it started to go away. And the other thing, going back to that internal customer, when I used to work at Victoria Secret Catalog, not as a model, but thank you all for thinking about that, one of the first things that they taught us was we treat our internal customer in the same way we treat our external customer because if we don’t … And that goes to anybody within your organization because if we don’t, then they’re going to hear their angst, they’re going to hear their anger through the phone, or they’re going to hear their anger when they’re out to dinner, and they overhear somebody badmouthing the organization. So, we treat everybody with respect and in the highest regard. And we have those crucial conversations when needed but we treat them exactly the same way as our external customers. Peter: [00:38:30] Correct, but that whole mantra, we got to be nice to them and everything. Well, you know, that’s called a human. Cara: [00:38:38] It is. It is. Cara: [00:38:39] It’s really not a generational thing. Everybody wants to be treated with that respect. Now, a quick explanation of why people were willing to get beat up in the past, why they put up with that, the baby boomers were so much larger than the generation X who came behind them. And so, what could the Gen-Xers do? They couldn’t fight their bosses. They couldn’t say, “No, we don’t want to wear pantyhose,” you know, or, “No, we don’t want to follow that policy or wear a suit,” you know or whatever. They didn’t want that stuff. They pushed back on the same things the millennials are pushing back on now. They wanted work-life balance. They didn’t want to work on Saturday mornings. But the Gen-Xers were such a small cohort, they didn’t have the strength in numbers to push back and to change anything. Cara: [00:39:29] So, they put up with it. Plus, their parents taught them to put up with it. They said, “You stick it out. You make a commitment. You stay late. You stick it out. You deal with a bad boss, who cares. They write your paycheck,” you know. Cara: [00:39:43] Where the millennials were taught … First of all, we’re a huge cohort. We’re already bigger than the Gen-Xers and bigger than the boomers. In two years, we will outnumber the boomers and Xers combined. So, heads up on that. But we’re huge, and that’s why we’re moving things along. Cara: [00:40:01] But, also, we live in a different world today. So, with technology, and we were taught to push back on authority. We were taught to question authority. And if we see something. say something. And we should have our voices count. And that’s totally different than the way the previous generations were raised. “Because my mom told me, if you’re not happy, get out. If you don’t like your boss, get out because life is too short.” And we translated it into, you might have heard the phrase YOLO, which means you only live once solo. YOLO. Cara: [00:40:40] Yeah, which, by the way, it’s not cool anymore. It’s like so 2012, but that’s what a lot of the millennials think is like, “Oh, I don’t like my boss. I’m out. I’m going to quit. I’m going to go work somewhere else. Everybody’s hiring,” or “I don’t like my schedule,” or “I don’t like the attire policy you have,” or, you know, anything like that. They can absolutely walk out the door today. So, the power has shifted, and it’s time for your mindset to shift as well. Peter: [00:41:08] It is. But I know that some of the angst out there, as I hear, “How do you manage these different generations?” And there’s a firm that they acquired another firm, and from what I understand, the original firm had a lot of younger generation, and this firm that they bought were very much for the older generation. And there was no middle. Peter: [00:41:30] And having a hard time managing the organization because the older generation, they’re stuck. They don’t want to move. The younger generation wants to move. They want to do, and trying to get everybody motivated, and moving in the same direction. It’s become a big challenge for them. Cara: [00:41:47] Yeah. It’s imperative that both sides see the other side of the coin. Cara: [00:41:52] So, we talk specifically. And I evolved my presentation in this direction over the past several years about generational differences is there is a spectrum and there’s a reason that people have a more traditional mindset because they were raised in a day with only three TV channels. So, you didn’t have options. You didn’t have choices. And then, today, we have Netflix, and Hulu, and Amazon streaming, and, you know, all these other things where we have choices, and we have drive-through windows, and credit cards to go get what we want. Peter: [00:42:50] Oh my God. I’m feeling old now. Cara: [00:42:53] I know, right. Peter: [00:42:53] What a gut punch. Cara: [00:42:55] Yeah, sorry, sorry. But, you know, since that time we just hear over and over about people not being who they said they were, or doing things wrong, and illegally, and stuff. So, of course, we were raised differently. We don’t trust anybody, and we don’t trust the company to have our best interest at heart, you know. So, once you share those stories of how our society changed, and how the millennials were truly raised differently, it helps the older managers understand and build more empathy for the staff, not in a fluffy way. I’m not trying to say, you know, “Oh, let’s all just be friends,” and you know all of that. Cara: [00:43:34] But as a leader, just understanding where people are coming from, and then the same, sharing that message of the spectrum with the millennials. They have no idea how business had been done for the past 30 or 40 years. And when you say, “Well, you know, my dad told me to be the first one in and the last one to leave,” I’m just going to like shrug my shoulders. That doesn’t make any sense to me because I have a 3-year-old, and I go back to work after he goes to bed at night. I’m a hard worker. I work a lot of hours, but I’m not sitting at a desk from 9:00 to 5:00. Cara: [00:44:09] So, you know, just sharing those messages, and really explaining the spectrum, and the fact that there’s no right or wrong. There’s no right or wrong whether you have a more traditional mindset or a more millennial mindset. But what we do have to do is get along. I mean, we do have to work together. And the managers and partners, I mean, they have to figure out what’s going on in the millennials’ heads if they’re going to keep a solid staff and get that staffing stability they need to provide all of the services for their clients. Peter: [00:44:43] Exactly. Hold on one second, Cara. Were you born when I was in office? It’s President Clinton here. Were were you born during my administration? Cara: [00:44:56] I think, I was actually born with Reagan. Peter: [00:45:01] I feel better now. Cara: [00:45:01] One earlier. I barely remember Reagan. Clinton is really the first president I remember. Cara: [00:45:08] I remember him being President. So, that was pretty much it. But yeah, I was born in 1981. Peter: [00:45:14] Okay. Okay. So, there’s a second gut punch. So, as we wrap up, there’s one last topic I want to hit on. Peter: [00:45:25] And because it’s going to affect a lot of professions, especially, it’s going to affect the accounting profession, is technology, artificial intelligence, and Watson, and I don’t have to crunch numbers. I have to understand them, but I don’t have to … I’ve said this that Excel will be extinct in about five years. They will never need another 10-key again, and they still. That’s blasphemy when I say a 10-key. Some people go, “What’s a 10-key?” You know that adding machine with the tape on the desk? But as technology continues to evolve, the professionals can be changed more of a consulting role versus a compliance role, and talk about a different set of skills that we’ve already talked about become even more important than ever before. Cara: [00:46:20] Yeah, absolutely. In fact, my CPA and I just had this conversation last week. She just made partner at her firm, and she said that a lot of the work we do will not be necessary in 10 years, the actual number crunching, like you said, and she knows that. Cara: [00:47:13] … but a lot more services. So, we absolutely cannot rest on our laurels and think that the model we have today, the staffing model is not going to be the same, the technology we’re using is not going to be the same. And so, we have to think about what does our staff need to be in 5 to 10 years, and what is that for our clients, you know, how are we going to serve the clients in that time, and what are the skill sets and the structure that we need to have to do that. Cara: [00:47:43] So, I encourage you to keep your eye moving forward even if you’re, you know, say, five years from retirement. There is going to be a lot of change in the next five years. And if you just say, ” Well, I’m on my way out. I’m just going to coast, and the next leadership team can deal with that,” you’re really setting that group up for a very difficult time. Please do not coast. Please do not hold anybody back from the changes and the advancement that we have to make, whether it’s the technology advancement, new systems, and processes, or it’s the staffing changes, and it’s new leadership models, and a new staffing structure. Please don’t hold anybody back from making those changes that we’re going to need to be competitive and to be sustainable over the next 5, 10, 15 years. Peter: [00:48:31] And sustainable is a big word that we have to evolve in order … If we don’t, we’re going to die. And, you know, we’ve been talking about this technology for a number of years, but, now, we’re really seeing it. We’re seeing the impact of it, of artificial intelligence, of block chain. I don’t understand block chain. I will. I thought it was an intestinal disorder, but I know it’s not. But what I do see is that what we do moving forward is going to be so different. And if we’re waiting for the universities to provide us with the students, no. I think, companies are seeing this. Now, they’re going to be responsible for teaching that student all of this other stuff that universities are not doing. And the university, that’s a whole other conversation. They need to change on what they’re doing, but that’s like moving a battleship on a dime. Peter: [00:49:30] It’s become more the employers’ responsibility to talk about business writing, and talking about these interpersonal skills, and doing all this other stuff. And it just kind of always evolve. Cara: [00:49:41] You’re exactly right. That responsibility is going to fall onto the companies. And that’s why you have to start implementing more training now on the technical side, as the technology changes. And, of course, compliance, and regulations, and things are always changing. We have to do that, but we have got to improve our soft skills, and even just the creative thinking, and innovation that we bring in, those types of things. But definitely the people skills, we’ve got to bring back more of that training. Peter: [00:50:11] Yes, we do. And before we leave, prior to us recording this, Cara has a special gift for our listeners. So, would you like to share that with them? Cara: [00:50:22] Yeah, absolutely. So, we are going to offer a free autographed copy of Staying Power: Why Your Employees Leave and How to Keep Them Longer, which is my new book. We’re going to offer a free copy. 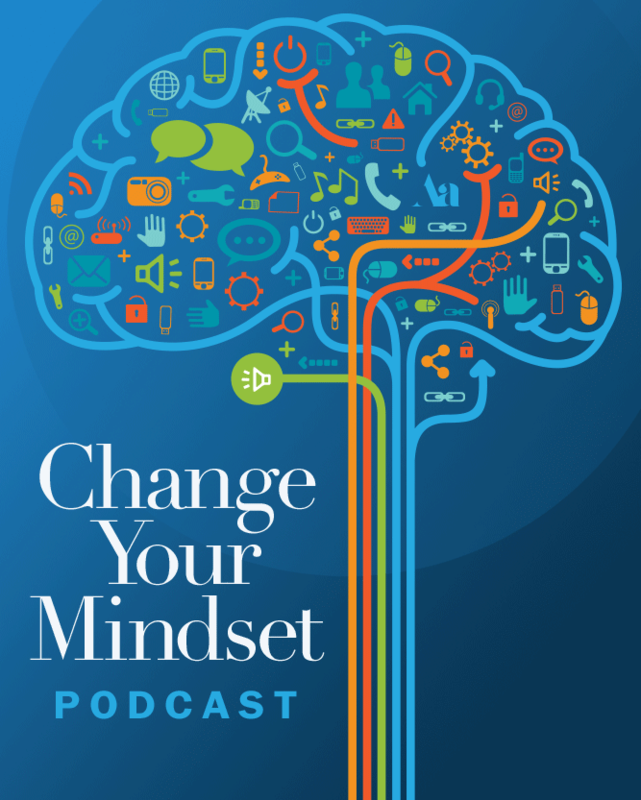 So, what we want you to do is go on to Peter’s social media for the Change our Mindset Podcast. Go on to any of his social media platforms and tag yourself, tag your friends, leave a comment. And after a week, we will, then, pick one lucky winner from his social media to receive that signed copy of my book. Cara: [00:50:58] So, we hope that you enjoy that. And, certainly, tell your friends if any of you are dealing with or struggling with employee retention, or managing and understanding millennials, then, definitely, you want to get a copy of the book or reach out to Peter and I.
Peter: [00:51:13] Great. And thank you for doing that. I greatly appreciate that. When I put this out of my social media, I’ll also write about it, and it’s to remind you of this giveaway. And I can’t thank you enough for taking time. It’s absolute pleasure meeting you. You’re the nicest U of L person I’ve ever met. Peter: [00:51:37] And I’m looking forward to probably seeing you at Influence in Dallas. And I know you’re coming to our chapter. I’m looking forward to that as well. Cara: [00:51:46] Absolutely. Thanks. It’s been a pleasure, Peter.